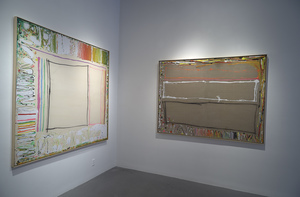 In the 1970s, Weinstein created “City-Sunscapes” that evolved from “delicate lyricism” to bold, gestural works expressing the light and air of New York City through paint viscosity and luminosity. (1) In 1992, she moved with her husband Stanley Boxer (1926–2000)—also a prominent post-War figure—to Ancramdale, New York. 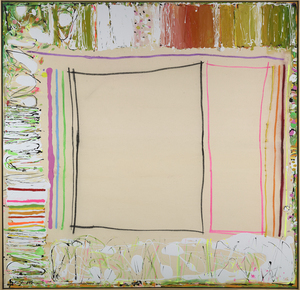 Subsequently she has continued to express the reality of her surfaces as flat spatial expanses while responding to the “beautiful countryside all around her.” The tension in her work is in its fine balance between these forces, between the physical reality of the canvas itself and the allusions she establishes. 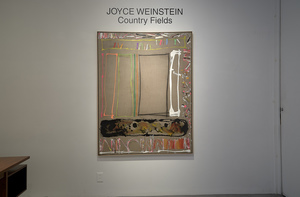 The art historian Karen Wilkin has identified this aspect of Weinstein’s recent art, observing that while her paintings never refer directly to the “appearance of the open, rolling countryside surrounding her home, she is obviously acutely attuned to the geometry of the farm fields that divide the landscape and to the shifts in color and light effected by the seasons, weather, and times of day. . . . 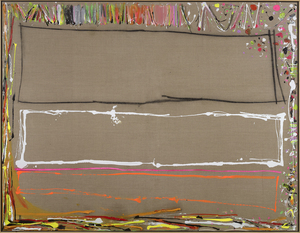 Yet no matter how persuasive the implicit allusion, we are even more powerfully aware of the abstract, calligraphic quality of Weinstein’s drawing; any incipient reference is cancelled by the forthright ‘presentness’ of the diverse marks.”(2) An example is First Autumn with a Yellow, which evokes either an aerial perspective on divided farmlands or the “beautiful writing” in a page of the Koran. 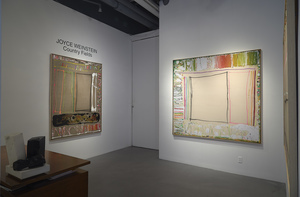 Not an artist who takes a remote stance, Weinstein uses an assertive mark-making for which she has a well-deserved reputation as a risk-taker who “refuses to play it safe.” Wobbly, sketchy, and raw lines form contours that approximate fields and countryside, while areas of scratched and scribbled color convey water, light, and organic growth. 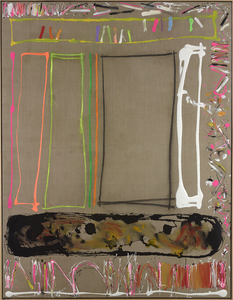 With both drawn shapes and active lines, Weinstein makes the linen canvas, left bare and unprimed, into space and atmosphere. 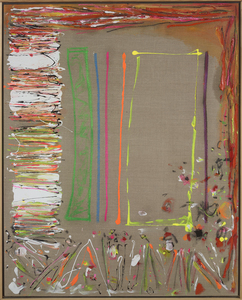 Her “contrary spirit” is also present in her unrestrained color, her ability to use “fluorescent greens, hot pinks, and danger-alert oranges (and get away with it),” as noted by Wilkin. (3) Nonetheless, a sense of peacefulness and order often presides in her “country fields” in the different seasons. Piri Halasz observes: “Although scratchy lines convey a certain sense of itchiness or irritation, they are set in a context of quiet reflection. Thus, as a whole, these paintings are harmonious, not grating, organized, and not chaotic. Above all, they are triumphantly human.”(4) Such qualities are present in Summer Ancramdale Fields, which seems to reconcile tension and liquidity, boundaries and openness, and sustenance and permanence.